Enter the Archeology Association to control the progress of your Excavations. There you will be able to fund more excavations to find Faction Coins, the rare Rubies and ancient Artifacts from the civilizations of the old. Archaeology was first implemented in the "Ancient Races" expansion for introducing the Neutral Factions. Excavating enables to find Rubies (See the Ruby page), with luck: Faction Coins, and at certain thresholds or under certain conditions: Artifacts. Specific artifacts are required to unlock the Neutral & Prestige Factions. 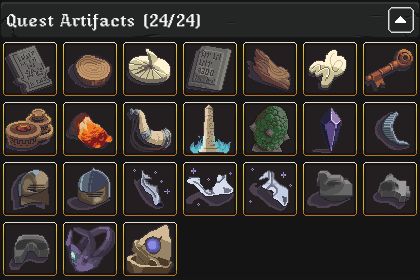 Some artifacts will reward direct bonuses and the amount of discovered artifacts take part in some Research upgrades. An "Excavation" button will then appear on the top left of the Upgrades tab and you may commence excavations. Cost: 1e35 (100 Dc). To be bought once throughout the entire game and does not show up as bought upgrade. Excavation: The first excavation costs 1 Oc (1E27) coins, and each subsequent excavation costs 20% more than the last. Formula: 1e27 ^ (0.75 ^ A) * (1 + (0.2 - 0.025 (if E290) - 0.025 (if Ancient Egg)) / 5A) ^ x where A is number of ascensions and x is number of excavations. Formula: 1500 + 0.05 * x ^ 2.75, where x is the number of excavations you have (not including the one just purchased). Cost: floor(x / 3000) + 1 rubies where x is number of excavations. Formula: 2000 + 50 * R + 500 * x here x is amount of resets this R.
Note: It will reset the excavation counter to zero, all previously gained Excavation rewards and Rubies will persist and you can not find them again. Finding all the faction artifacts for a specific faction will also unlock a new selection of upgrades called "Artifact Sets". You will be able to pick one per game only, similar to Bloodlines and Lineages. Abdicating will reset your choice and allow to pick another. 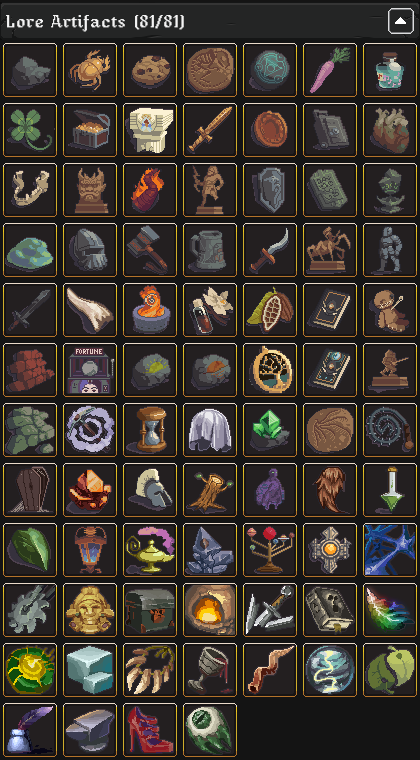 Requires all artifacts related to the faction to use its set. Thank You!!! for all your help.